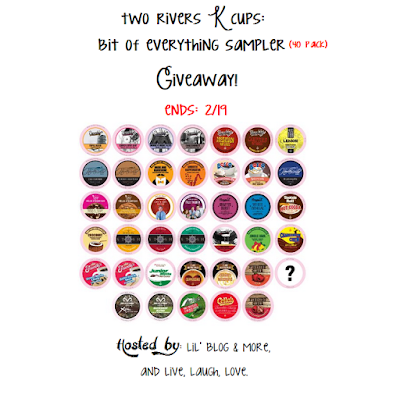 MarksvilleandMe would like to welcome you to the Two-Rivers K Cup, 40 pack, Bit of Everything Sampler Giveaway! We would like to wish everyone who enters Good Luck! And co-hosted by: My Silly Little Gang, and Another Cent Saved. K cup lovers, come join in! This awesome giveaway features 40 delicious cups, of a mixture of coffee/cocoa/tea, all from Two Rivers Coffee. This pack is great, because you get to try such a wide variety, to find out what your favorite flavor is, before spending so much on just one flavor. Disclosure: The bloggers involved in this giveaway were not compensated, and are not responsible for prize fulfillment. Lil' Blog and More received free product in exchange for this post. All opinions expressed within this post are her own, and were not influenced in any way. Must be 18 years of age or older to enter this giveaway. This giveaway starts February 5th, 2016, and will end on February 19th, 2016 at 11:59 pm. The winner will be emailed, and have 48 hours to respond, or a new winner will be chosen. Once a winner is drawn and confirmed, the name will be announced on the GiveawayTools form.